• To prevent damage to the plastic parts, do not clean with chemical solvents or strong detergents. • To remove road tar and insects, use a tar remover, not a scraper or other sharp object. • To protect the surfaces of bright-metal parts from corrosion, apply a coating of wax or chrome preservative and rub to a high luster. • During winter weather or in coastal areas, cover the bright metal parts with a heavier coating of wax or preservative. 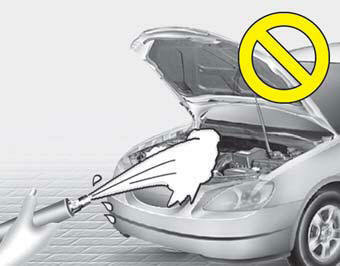 If necessary, coat the parts with non-corrosive petroleum jelly or other protective compound. • Do not use any abrasive cleaner, polishing compound, solvent, or wire brushes on aluminum wheels. They may scratch or damage the finish. • Use only a mild soap or neutral detergent, and rinse thoroughly with water. Also, be sure to clean the wheels after driving on salted roads. This helps prevent corrosion. • Avoid washing the wheels with highspeed car wash brushes. • Do not use any cleaners containing acid or acid detergents. It may damage and corrode the aluminum wheels coated with a clear protective finish. Protecting your vehicle from corrosion By using the most advanced design and construction practices to combat corrosion, we produce cars of the highest quality. However, this is only part of the job. To achieve the long-term corrosion resistance your vehicle can deliver, the owner's cooperation and assistance is also required. • Road salt, dirt and moisture that is allowed to accumulate underneath the car. • Removal of paint or protective coatings by stones, gravel, abrasion or minor scrapes and dents which leave unprotected metal exposed to corrosion. • If you live in a high-corrosion area — where road salts are used, near the ocean, areas with industrial pollution, acid rain, etc.—, you should take extra care to prevent corrosion. In winter, hose off the underside of your car at least once a month and be sure to clean the underside thoroughly when winter is over. • When cleaning underneath the car, give particular attention to the components under the fenders and other areas that are hidden from view. Do a thorough job; just dampening the accumulated mud rather than washing it away will accelerate corrosion rather than prevent it.Water under high pressure and steam are particularly effective in removing accumulated mud and corrosive materials. • When cleaning lower door panels, rocker panels and frame members, be sure that drain holes are kept open so that moisture can escape and not be trapped inside to accelerate corrosion.